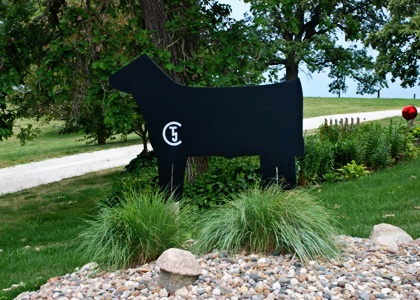 TJC CATTLE COMPANY is conveniently located in Woodward, Iowa, just North of Des Moines, Iowa. We don’t run big numbers but strive to raise high quality, sound, and functional cattle that will work for anyone. We got started in the club calf business in 1996 when we began selling club calves by private treaty straight out of our pasture. Through the years, we have continued to improve the quality of our cattle as well as advance the marketing program of our farm. We currently run a 35-head operation where nearly every one of our cows are mated to the hottest sires in the business through AI. We now host an annual sale every fall. The majority of our calf crop is sold through this sale, where you will find a nice offering of show steers and heifers that will fit into your program. Our love for the cattle business runs deep. Both Joni and Todd grew up showing club calves at county fairs and open shows. After they got married, they began their cattle business with the goal of raising a small group of cattle that are exceptional in quality. Around this time, Todd also began working for Hawkeye Breeders Service, and he has been employed there for nearly 20 years. The Campidilli Family enjoys what they do, especially the gratification that comes from seeing young people find success from cattle they have purchased from TJC Cattle Co. Visitors are always welcome just give us a call or come by if you are in the area!